Have you ever seen an item at the grocery store that you thought there would be no way that thing would ever end up in your cart? Looking at said product makes you recoil. No how, no way am I buying that. Yet somehow, someway it finds it’s way into your shopping cart? I have had those experiences in the past (example: asparagus, brussels sprouts) and I just had one of those experiences again today. 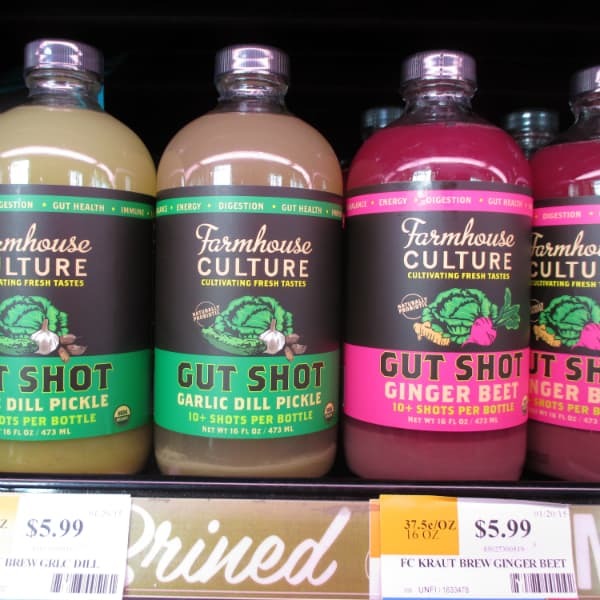 At my local Whole Foods market, I have been noticing these gut shots from Farmhouse Culture. The company is known for their sauerkraut and kimchi. I also think they have really lively packaging – with vivid colors and bold & easy to read words in an attractive font. It was practically jumping off the shelf – big props to their marketing guy (or girl). Back to the point, I thought I would never try this stuff. I am not a “kraut fan” to begin with. So why am I even talking about this right now? I am in the midst of a 3-day cleanse to help fight off excess yeast in my body that may be the root of my continual sinus troubles. During this cleanse, I am eating only vegetables. No fruit, no cheese, no meat, none of the things I love and carve. The veggies I am having are low sugar and low starch vegetables. 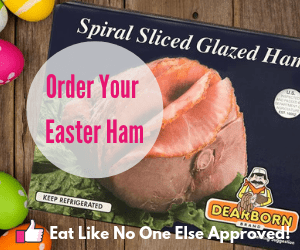 No potatoes, carrots, sweet potatoes, beets, etc. Not easy to do, but good for my health. 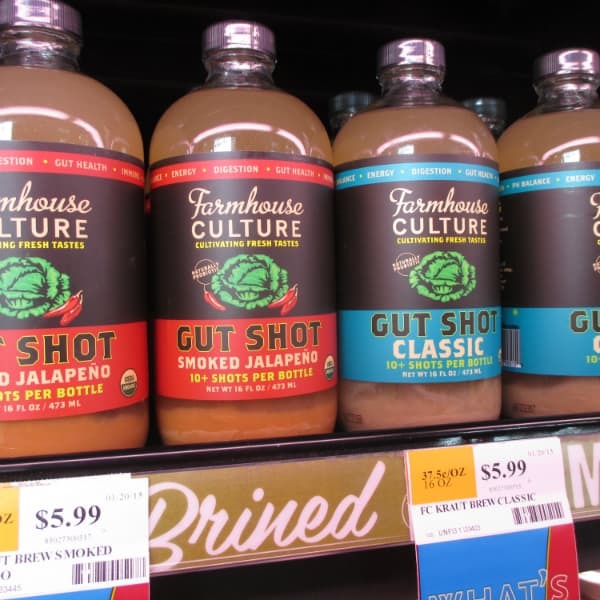 When I spotted the Farmhouse Culture Gut Shot drinks I decided this is the time to try it. The cleanse is all about improving gut health which in turn should improve my overall health. The gut shots contain natural live probiotics, just what benefits my gut. They had several flavors available – Classic, Ginger Beet, Garlic Dill Pickle, and Smoked Jalapeno. For my cleanse sake I needed a flavor that didn’t have any sweet veggies in them, so I passed on the Ginger Beet. I also say the Classic has caraway in it, and I can’t stand caraway at all, I don’t even like the smell. So Garlic Dill Pickle it is – I do like pickles. When I opened the bottle I was greeted by a strong scent of garlic, cabbage, and cucumber. What the heck I am thinking – this stuff smells as bad as it sounded to me. I gave myself a pep talk, making sure a sink was nearby in case, pouring the drink into a little disposable cup and went for it. I was floored. It didn’t taste bad. No at all. In fact, it was quite good. I got the sensation of eating a dill pickle in liquid form. It sounds weird, didn’t taste weird. I can’t get over actually how good it was. The flavors were well balanced. I can’t imagine they could do a better job. My hat’s off (if I wore hats) to Farmhouse Culture – you have one surprised and satisfied customer here. It also helped out with the stomach ache I was having at the moment. Happy tongue, happy tummy, happy gut equals a happy blogger! Now that I was over the initial fear of trying Gut Shot, I wanted to give another flavor a shot. Ginger Beet was the choice. 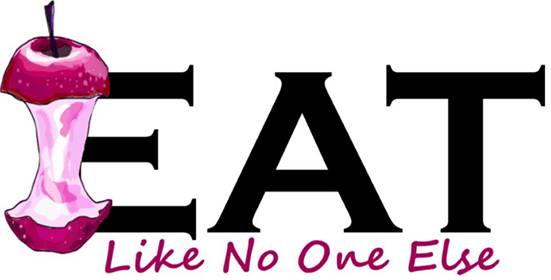 I am not the world’s biggest beet fan. Shredded raw on top of a salad where you don’t get much of the flavor is the most often way I use beets. The Ginger Beet Gut Shot was more beet than I was use to. My wife is even less tolerant of beets, so she was having no part of this one. I would buy it again to change things up, but the Garlic Dill Pickle is really where it is at. 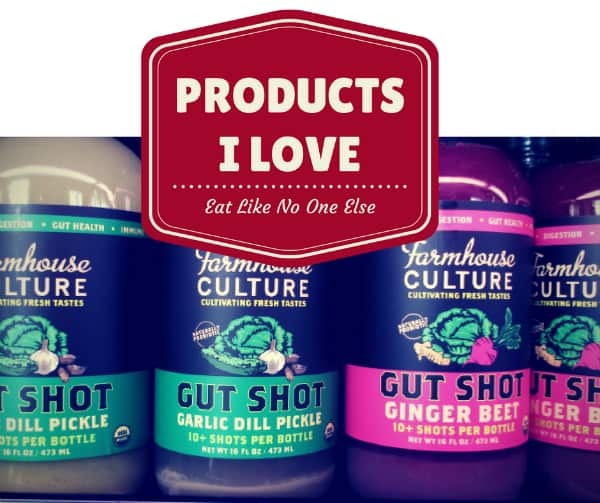 Not only do Farmhouse Culture Gut Shots have awesome benefits they taste good as well. We all experience heading to the store for a favorite and see that it not the shelf. What gives? There is a couple things to factor in. If a sale is going on, the product can move faster and the more popular flavors can be sold out and the store may take some time to re-order. Some retailers chose not to carry the entire line. It is up to each store’s discretion. I contact Farmhouse Culture and they said give this product request form to the store’s grocery manager or buyer. 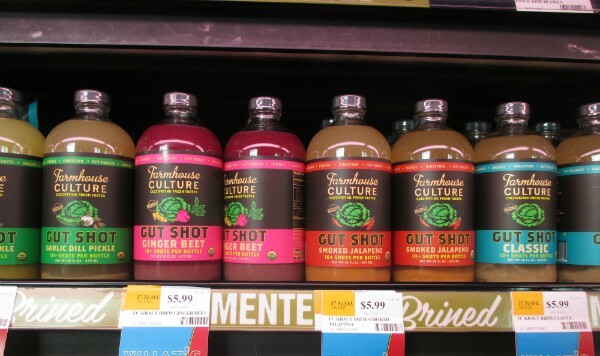 Are There Any New Gut Shot Flavors Coming Out? Right now there is nothing new in development at this time in terms of gut shot flavors. Did You Know Farmhouse Makes Kraut Krisps? Something I discovered recently is that Farmhouse Culture is in the snack game. You can buy chips that contain their sauerkraut. How cool is that! These Kraut Krisp chips are made of corn and brown rice flour. The first ingredient is actually sauerkraut. An unique way indeed to get your probiotics, especially when you are on the go! The Kraut Krisps are available on Amazon and Thrive Market – Get an extra 25% OFF your first order when you sign up at Thrive Market! What flavors of Gut Shots have you tried? Leave a comment below with your thoughts! Previous Post: « Where Can I Buy Minute Maid Pomegranate Blueberry Juice? OMG! You are spot on in your review! I too tried the pickle & garlic and LOVED it.!! I went the other day to get another bottle and they were out, so I tried the Kimche. It was a tad bit spicy but still yummy. I just called Whole Foods to see if the pickle/garlic was in and they told me to check back tomorrow. I said I was going to buy 5 bottles because I loved it so much and the clerk told me I would get a discount if I purchased 6!! Just keeps getting better! :). I would recommend this to anyone who likes pickles and/or garlic! Thanks for the kind words! I am glad you found and are enjoying the product. I could have written your review myself! Same experience and bought it not planning to as well. Actually I did not buy it. I was asking where the fermented foods were at Whole Foods and the clerk showed me Gut Shot and gave me the “Try it on us” Sticker. I then went back a week later and bought another bottle. I LOVE the dill pickle. Perfectly described as eating a dill pickle in liquid form. But now my Whole Foods just can’t seem to keep it in stock. I tried Kimchi but its too spicy for me. This was a great find! i hope they get more. I can’t find anywhere else. I was wondering if anyone knows of another store that sells this, or if I could buy it online somewhere? My doctor in Houston recommended it, but I am now back in my small town college. AKA, no Whole Foods. I haven’t heard of any other place carrying them. Try directly contacting the company itself. I was ready to be totally grossed out by the Gut Shot Classic but to my surprise and delight it was yummy, in a “hey this isn’t disgusting!” kind of way. As soon as I opened the bottle it smelt strongly of cabbage, which I LOVE! It’s tangy and salty but the tastes are all complimentary. I’m trying to rebuild my intestinal flora after having been prescribed a very, very strong antibiotic. Hopefully Gut Shot can help me out. My self to eat it. Then one day I did! Not bad! today. Very happy with my new discovery? You can search up to a 1000 mile radius. You can do it!!!! Let me know when you take the plunge what you thought. Great Review, I love pickles but didn’t want to try the pickle one first so I bought the Ginger Beet. I will try it in the morning and see how it is. Curious how big your shots are. I know the bottle says 10 shots per bottle. Also if says shake lightly so do I make sure the stuff on the bottom is blended?? Thanks! Thanks! I didn’t know Sprouts carried them. I always go there when I am in California. Honestly whenever I drink the stuff, I don’t measure it, I just find of wing it. Years ago most “health food” stores sold sauerkraut juice. I had been searching for years but it fell out of favor with the public. If you found it at all it was bottled but not refrigerated. My grandmother and mother both drank sauerkraut juice. Open a can or package of Bubbles sauerkraut and we fight over it. She knew it was good for you. She did many things that are now in vogue and did it in the 50’s. I am so happy for the fresh juice. I dont have to juice it anymore. That is great. Thanks for sharing. I am glad you were able to find it after years of searching. I am addicted to the Garlic and Dill Pickle! I wish I could just drink a bottle a day instead of just a shot!!! 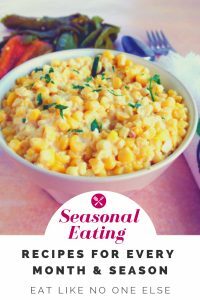 It is delicious and totally cures my salt cravings lol!!! That’s wonderful that you found and are enjoying it. Thanks for sharing. Do you like any other flavors? i got mine at Little Green Planet. Beet ones. kind of sour. I get used to it. really change my bathroom habits. Absolutely love the ginger beet. Going to start taking it 3x a day, because it’s just that good. Next I want to try the garlic dill then classic. Up here in Canada I’ve seen it at a couple locations.